Ngmoco has unveiled new screenshots and a video trailer of its forthcoming game Star Defense, exclusively for the iPhone and iPod touch. The game is expected to hit the App Store in early May. Star Defense pits the human race against an alien species called the S’rath. 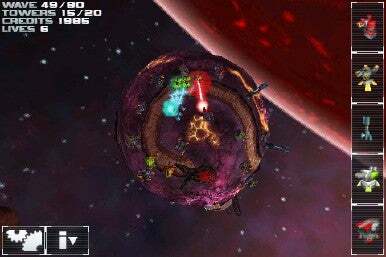 Star Defense plays similarly to “tower defense” games, in which you try to defend your territory from an onslaught of invaders by setting up defensive batteries — turrets that can blast plasma, use high voltage and more in order to keep invaders at bay. Star Defense uses multi-touch controls on the iPhone and iPod touch and also sports 3D environments. Each planet you defend sports unique pathways to protect and unique weapons to deploy. The S’rath constantly fortify their own forces with new unit types, new formation and new armor, to keep you on your toes. 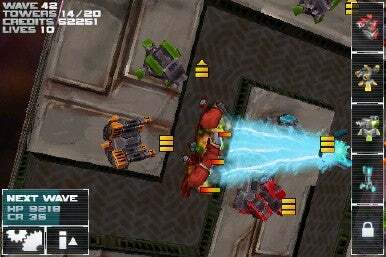 Ngmoco is the publisher of Star Defense, but the game itself is being developed by Rough Cookie. The game features 15 weapon types, each with specific attributes, firing ranges and reload frequencies. Gameplay is spread across seven different worlds. You can unlock “Commendations” and earn medals by achieving goals in battle and accomplishing specific feats.